It’s one of the spires from the Compo Beach bathhouse. Peter — a longtime but now former Westporter — says that one of the spires, and some brickwork, fell off in a long-ago hurricane. He dragged it over to the sand, photographed it, then used the image in several paintings. At some point, he says, the town decided to remove all the spires. They were knocked off with sledgehammers, with no attempt made to save them. Peter asked Randy Eaton, on the Parks and Recreation Department’s maintenance staff, if he could have one or two. Randy took a couple for himself, and told Peter he could have any others. He took 5 or 6 home, in his car — one at a time. (“They’re large and heavy,” he notes.) He’s often thought about restoring one, but never got around to it. Jonathan McClure was the reader whose guess came closest. He wrote, “Concrete architectural finial from a long ago demolished Compo Beach structure?” The bathhouse is still there, though the spires/finials are just memories. Hint: Unlike the Compo bathhouse spire, this one is definitely still standing. This entry was posted in Beach, Photo Challenge and tagged Compo Beach bathhouse. Bookmark the permalink. The top of Kings Highway School. This looks like the top of the historical building (which has changed what grades were assigned there. Westport keeps shuffling the school K-8 th grade around every couple of years) which I drive by on US RT 1 near the intersection of Kings Highway. 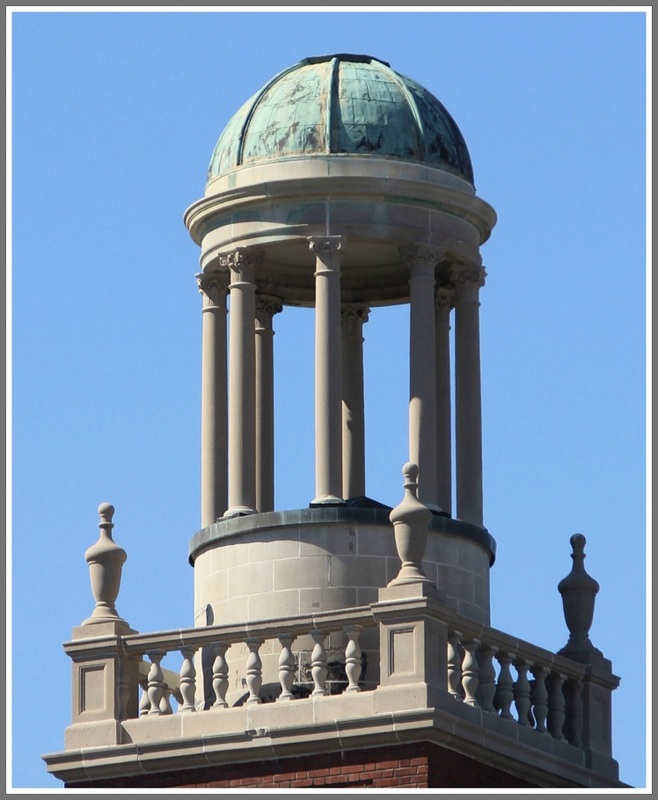 Note also that the four spires at the base of this cupola are VERY similar to the spires that once were on the brick bathhouse at Compo (last week’s item). Both buildings date from the late 20s-early 30s. Looks like the roof top of Kings Highway school. The top of King’s Highway Elementary school, formerly Bedford Junior High School. Yes — all correct. The cupola is on top of Kings Highway Elementary School — or, as it was known from the 1920s through 1968, Bedford Junior High! an easy one– kings highway school! an example of good public architecture from our civic-minded forebears. I am just logging on and started from the bottom of the Comments and finally got to Dan’s and then Michael’s but what I, given my age, wanted to say was……you mean Bedford Jr. High School. So, in my own mind Michael and I got it right! Yes, I know it is not an elementary school and Bedford Elementary is Town Hall but old memories linger on, which is better than then the alternative of not remembering. As always, Thank You. .To Lawrence yes, our forbearers had the good sense to approve and provide excellent architecture. It’s the cupola on top of kings highway! I’m with Mary Cookman Schmerker and Mike Calise… They got it right – that building will always be BJHS to longtime Westporters, just as “Saugatuck Elementary” will always be…. Staples. The building is engraved in the concrete above the front entrance ‘Kings Highway School’ with ‘Westport’ in larger engraved lettering above. Yes, to the long time Westporters still here and afar it will be Bedford Junior High School (BJHS) what we call Middle School now. However, the building started out as the engraving says on the building Kings Highway School. I think you can still see “Bedford Junior High School” faintly in the engraving. It was Bedford Junior High from its construction until 1958, when Staples moved from Riverside Avenue to North Avenue. Bedford Junior High moved from that Post Road West building across the field to take over the old Staples, and a “new” school — Kings Highway Elementary — took over the original Bedford Junior High. Well, I am late to this party, but my gut reaction was either Bedford Jr. High (Riverside location, early 80’s), or maybe King’s Highway Elementary School, around 1970’s, when I attended at that time. That’s Kings Highway Elementary School, now known, I believe, as Kings Highway school. (I’m not sure if there’s an apostrophe in “Kings” – I don’t think there is.) My alma mater for K through 6. Was anyone else afraid of the principal, Dorothy Sleep? If I’m right..Top of Kings Highway elementary formerly BJHS and formerly Westport Junior High (not positive about this) but I think (further research is needed) that Frederick Law Olmsted did the gardens there originally.